The OSTs are awesome though I'm disappointed because Myung Soo and Ara could have collaborated on an OST for MH. Their voices are beautiful and a joint OST would be great! I am a big fan of Infinite L (Kim MyungSoo) so I do pay close attention to his acting. I am very happy that Miss Hammurabi with him as one of the main leads received many praises and the drama was a success. Please, if anyone who can translate my message to Hangul, translate it and post it on Naver or any Korean forum so Kim MyungSoo could read it. First, he needs to improve his posture, he needs to stand up straight or he will have a hunchback later all. By standing up straight he shows his confident and his height since other fellow Korean male actors are very tall. Second, he needs to genuinely smile, not a tight lipped smile when he purposely stretches the lips to right side to show the dimple. We've already known he has two dimples. Thirdly, when he acts angry, he should not cringe his teeth because it shows unnatural and bad acting, just use emotional memory and go all out by not worrying that your face won't be handsome. Because, handsome guy gets more handsome and cool when he is angry, and Myungsoo will look handsome no matter what he does to his face. Please work on your angry acting and stop cringing teeth. Finally, because he is an idol so he always has to worry about his image, however; when you are acting, you need to show your emotion, and not worry about your image, then you will become a better actor. I am always looking forward to Kim Myungsoo -- an actor with new work, new drama. 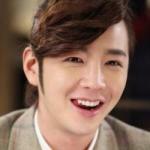 Because I am your true fan, I wish that you will improve and become one of the best Korean actors. Regarding Go Ara, she is pretty, good crier but I am sorry to say this, she is bad at every dramas, and always overreacting. Oh..boy I really miss this drama. Monday and tuesday its not the same. lol.. Since you have serious concern about Kim Myung Soo's acting , you should feedback to him personally through a private platform and not public cos some of your comments are not exactly favorable to him. This forum is not a feedback platform for the actors and actresses. It's a drama thread about the plot and characters. To me, Kim Myung Soo did an excellent job as Judge Im Ba Reun. I thoroughly enjoyed watching him giving his best in MH. As for Go Ara, you're entitled to your opinion but it's a bit unfair to say that she's bad at every drama. That's generalization. Have you seen her in Reply 1994? Or You're all surrounded? There has to be a clear distinction between the real person and her character requirements. Ara did a superb job as Judge Park Cha O Reum in MH, despite knowing that her character is controversial. She is brave enough to take the risk and it pays off well. To me, she's one of the most hard-working and real actresses around. Unpretentious. Natural and sincere. Awesome acting. No frills. Adorable and down-to-earth. Here's some questions for anyone who still has Miss Hammurabi in his/her mind: Answer whichever works for you. 1. Which episode has been a stand-out for you? 2. At which point in the drama, got you hooked, to follow through all the way? 3. Which character is the most relatable to you? 4. How many times have you watched MH? 5. Name 3 scenes you would replay and reflect upon. I have been thinking about the episodes that have to do with court personnel. Those are the people who aren't in the limelight like the judges, but who make everything run: the security officers, the clerks, the stenographers, the janitorial staff. I really appreciated that the show gave some attention to their lives, their talents, their problems. In particular, I was moved by the court clerk who was a single mother -- she worked diligently and uncomplainingly, and then rushed to pick up her child from daycare. She agonized about whether her best was good enough for her child. For her birthday, she got to let loose a little -- dress glamorously, and dream about romance. This show is so good about making human people who are so often overlooked. On a separate and totally frivolous note, the Knowing Bros episode 131 on which Go Ara and Kim Myungsoo appeared is adorable. They apparently shot the episode the day after production wrapped, so maybe the actors were still in character -- certainly Kim Myungsoo said that he was still talking like Im Ba Reum. Or maybe the people in the editing room were trying to sell a shipping line. Whatever the reason, there sure seems to be genuine affection between GA and KMS. KMS can't help smiling (and he really tries not to) or leaning towards GA when GA does or says anything remotely cute. He steps forward to help her when she is having trouble with limbo. He can't help giggling after the brothers tease him that when he says he lives with a cat, maybe that's code for living with GA. He looks down shyly when GA talks about first love and how she fell for a boy from church who brushed snow off of her feet. He peers at her intently when the brothers joke that GA must have dated Henry when she taught Henry English. He listens attentively to her talk about her childhood dream of being an anchor and her experience of online anti-fans. He looks eagerly at her when she seems stunned at the revelation that he had to throw up noodles that he ate while acting. For GA's part, she looks reluctant to demonstrate her dancing skills until she sees him urging her on with his clapping. It all makes one long for the two of them to work on another drama (or do anything else, really) together. I thoroughly enjoyed watching both in Knowing Brothers and seeing their closeness there as well. Ara suggesting ice-cream as the prize....they had an ice-cream scene right? and MS was caught eating ice-cream during his regretful moment...perhaps Ara knew that he likes ice-cream? Whatever the reason, there sure seems to be genuine affection between GA and KMS. Agree undoubtedly with you. Their affection and support for each other was evident from the early stage of filming as we saw Myung Soo happily passing Ara's birthday cake to her. Ara's birthday was on 11 Feb and imagine their first script reading was on 16 Jan...in less than a month, they had developed a close relationship, enough for MS to take selfies with her at her food truck when she was carrying her birthday bouquet and during the hall volleyball event bts where he passed her the cake and wished her happy birthday personally. Too bad Ara was busy thanking the crew....lol. Throughout filming, we saw from Ara's selfies in her ig with Myung Soo and most were in close proximity, head touching head and shoulder touching shoulder, arm linking arm etc...I'm so glad they had such a close camaraderie and perhaps because they're so close in real life, their chemistry shines through Miss Hammurabi and draws everyone in, with many wishing for more romance in the story. There is minimal romantic moments yet Ara's chemistry with Myung Soo is so great that many wish for more romance with this beautiful couple. However, even up till the last ep, the PD had kept it to the minimum and the story ends with court cases again. It's truly just a legal drama and the excellent visuals of our lead couple is wasted. Pity. That's my opinion. Of course others will say it's a legal drama after all. Still, without romance, you don't need 2 visually beautiful soulmates to be the lead couple, do you? I felt an anti-climax in ep 16. I couldn't believe that there was no follow-up with baReum's date in ep 15. It was left out in the cold. It leaves a craving for Season 2 with both legal and romance genres of course. Fact is - stick to the original cast. The dramas' PDs have a knack of changing artistes for sequels and mostly, it's not as popular as the original cast. Ep 16 did not give me the satisfaction of seeing CEO Yong Jung being brought down badly as promised by Ba Reun. I need to see that! I also need to see Ba Reun and O Reum fulfilling their bicycle date at the romantic Han River, darn it! Or both walking down the isle...yes, that would be better. A married couple for judges...hmmm...they'll definitely have double pension! #jtbc - Season 2 please. 1. Im Ba Reun to O Reum : "Have you thought that what you wanted as justice could actually be revenge?" - I can't remember this ep but it was a wake-up call for O Reum and she admitted that she was seeking revenge in truth because she felt a close connection with all her cases - the sexual molestation, the suicide case and the abuse case....when she was confessing to the female judge and crying in her arms. That was awesome and she stood out totally with her admission and honest sharing of her sad family story which had shaped her into wanting to fight for justice for the weaker ones. 2. I got hooked from the start...lol..mainly due to the beautiful leads, then their beautiful high school story and the English OSt - someday, somehow coming in at the right time as both were separated after that confession from O Reum about her piano teacher molesting her and she confided that she was afraid to speak to her dad....and later in the final ep then it was shown that Ba Reun actually went to the police station with a molest report...that's so sweet of him...except that he was ticked off because he wasn't her boyfriend...poor guy. The subway wrestle against the old man for the molested woman, the courage to talk back to the loud voice lady and the stretching to put that guy's legs into place....I was mesmerized by O Reum's courage right from the start....it's easy to get hooked.....and wishing for more romance too! 3. O Reum's character to stand up for the weak and the poor....definitely. But it's not a popular character for sure. You will face a lot of resistance and hostility in reality. I had. It's easy to take sides right from the start, depending on your preferred basis. For me, my heart usually goes out to the poor and weaker ones....lol. I would have banged my head many times too, if I were Park Cha O Reum. 4. Countless times. Replay after replay. All the exchange between Ba Reun and O Reum. He raising his voice that she'll get hurt if she persists with her rebellious ways. Ba Reun's sweet gesture of wanting to send out the email for the Judges' Meeting for O Reum and again in another episode where she wanted to report that friendly judge for corruption. He wanted to help her again. Favourite scenes especially those that showcase my beautiful couple - Myung Soo's and Ara's loveline, if you even think there's one. Just a bicycle date and a brief butterfly kiss and hands holding scene in ep 15 - did someone say the PD gave us crumbs where their loveline deserves a main course? Too bad it's a legal genre! Oh yes, Ba Reun putting his hand on her shoulders to calm her and O Reum seeking refuge and consolation in Ba Reun's arms were some of the best scenes. His stroking of her back is heavenly. I won't talk about the court cases because they are obviously.....memorable lessons to be learnt. 5. (i) Judge Han: " The pain of the victim cannot be weighed on the same scale as the pain of the perpetrator" - this calls for conscious effort to be fair and give due consideration to the circumstances of the victim and her trauma arising from the inconsiderate and purposeful act of the perpetrator. (ii) Judge Han: " Judges are the most dangerous and most powerful people in court" - so are people who are in a position of authority - be mindful that decisions made will have consequences that may be drastic for some. (ii) Im Ba Reun : " I'll go with you. Wherever you go" - I couldn't resist this. It's the sweetest words that a guy can ever utter to the girl he likes and it's a romantic way to show his deepest feelings for her. What more assurance does the girl need if she faces a difficult decision? Whatever she decides, she'll have her beloved boyfriend around to support and love her. Isn't that wonderful? O Reum is very blessed to have Ba Run who is prepared to give up his passion as a judge for her. Without the need for words, he really loves her a lot since he first crushed on her. To be loved by guy who is smart, remotely detached with an aloof exterior but has a soft and gentle heart inside and who is prepared to go to the end of the world for you - is one of the best gifts of life! Don't you think? Thanks for bringing up such interesting questions for discussion and MH definitely deserves lots of discussion even though it has ended. @jl08 Thank you for sharing your thoughts! I really appreciate it. Episode 3 is a stood-out for me because for once I am able to watch a kdrama written to address sexual/work harassment straight to the point and able to get different point of views, especially from the 3 judges. Leading to the stories that made Episode 4 & 5 equally important. Same here, I got hooked from the moment each of the characters were being introduced and even the side characters. They each have reasons for their actions and perspective that I could find relatable or have met such a person. Like the case of the child custody speaks close to home for me. The first time I've watched a kdrama that carries so much truth and issues that sometimes I feel like I was watching a semi-documentary not realising a full hour has passed in every episode. At the same time, I appreciate those lighter moments of funny scenes and the first love storyline because without those, I think I will take a longer time to recover from heart ache or puffy eyes from each episode. I find both Im Ba-reun and Park Cha Oh-reum so relatable. Watching these two characters made me realised they both reminded me of how in each situation life put you, there is always something to learn from both failure and success. I've watched MH twice so far and it is definitely a drama I would watch again when the time calls for it. The ending scene of Episode 5 when OR gave her closing speech is a must to replay, followed by the ending scene of Episode 15 when Judge Han voiced out for his younger judges and then of course complete it with the Im-Ba reun Tour. Although a scene I don't wish to replay but it does play in my mind often too is when OR hugged her mum who recovered and remembers her. I've been in similar experience before so it made me feel thankful for my mum's health these days. I sincerely hope everyone who has watched Miss Hammurabi can find lessons and moments that can put you in the light of positivity while living in this life. MS is truly one of those special dramas that can bring about an awareness and I love it for that. More beautiful FMVs to share....Miss H ammurabi is blessed to have many awesome fans doing MVs, especially featuring our lovely OTP Ba Reun and O Reum. I wish to see them collaborate together again in a blockbuster drama or movie! Thanks to @ende for highlighting the second MV! It's lovely! Really miss them. Cici: But just as I was getting comfortable with the progression of Ba Reun and Oh Reum’s relationship, Min Young Joon enters. The way he makes sure Ba Reun knows how much he and Oh Reum have in common is going to play on all Ba Reun’s insecurities. Tanya: I’m hoping this turns into a wonderful rivalry, honestly. One of those that you can’t really be mad at because of the way it advances the characters. I think Ba Reun will be forced to face the leftover feelings he has from school earlier than he anticipated. We know he has some major insecurities, but I think his friendship with Bo Rang will keep him from giving up. Bo Rang always has awful advice, but the atmosphere is the best. Janet: But hidden inside that awful advice is just enough truth and perhaps wisdom, to get Ba Reun thinking about what is really at stake. As different as they all are, they do have a common bond - righting injustices and helping others. I think it will be very interesting to see who they help next. I found this recaps of Miss Hammurabi by chance and it gives a valuable, thoughtful recap and review of this beautiful drama. Reading this reminded me of certain details or perspective that I have loved about it or might have missed. The drama continues to remain effortless to watch and brings us many great learning lessons and themes which other dramas rarely attempt to do. It’s for this reason and so many more that ‘Miss Hammurabi’ remains enjoyable and stands out. 10 episodes in and it is still the same drama that it started off as: eye-opening, light, warm, and powerful. Oh-reum rarely displayed any emotions or signs of distress and pain although she clearly felt that way many times throughout the drama. We’ve been so used to seeing her so hard-headed and loud and heroic that to see her cry and break down and be so afraid of the future was so challenging to watch. Her entire world is shattering and falling apart all at the same time in the worst ways possible and she’s not sure of how to fight back and to react. Out of all the characters, Ba-reun to me was the one who changed the most and the one who I am the most proud of (although I’m also very proud of everyone else). Before he met Oh-reum, he was so aloof, cold, reserved, quiet, and complicit and he had his reasonings to be so. But through Oh-reum, he started to be more daring, bold, confident, out-going, and persistent and when Oh-reum was falling apart, he was the one there to hold her together and keep her strong. He also took the time to learn more about his parents to find what ways he could contribute to improve their family dynamic. Whether it’s work, relationships, family, or himself, Ba-reun developed in so many ways in all those aspects and I truly am so proud of him for doing things he would have never done ever. And of course, that was all thanks to Oh-reum. A lovely and entertaining drama that I got interested in only after reading positive reviews about it. Knew about this drama but the title sounded iffy to me. Still don't know what 'Hammurabi ' means.